The same crown wheel is used by all the Standard (ST) and Font FHF listed here. Calibers, 96, 96-4, 97, 969, 969-4, 974. The same crown wheel ring is used by all the Standard (ST) and Font FHF listed here. 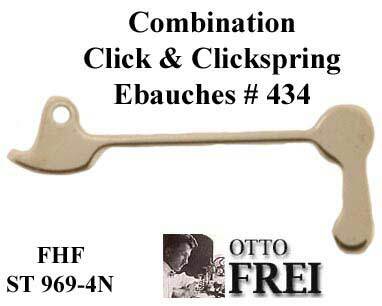 Calibers, 96, 96-4, 97, 969, 969-4, 974. The same pallet fork & arbor is used by all the Standard (ST) and Font FHF listed here. 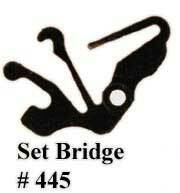 Calibers, 96, 96-4, 97, 969, 969-4, 974. The same set wheel is used by all the Standard (ST) and Font FHF listed here. Calibers, 96, 96-4, 97, 969, 969-4, 974. The pivots on Escape wheels are available different ways depending on the exact make of of the watch movement. Escape wheels pivots are called "S/C" and are Ebauches #703 is given when the the watch movement has jap jewel on only the lower side. 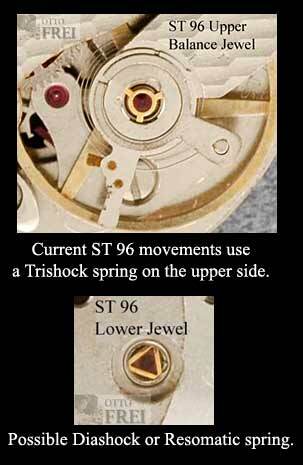 Most of the ST96, ST969N and ST969-4N movements have had cap jewels on the lower side only with a hole jewel on the upper side. The pivots on Escape wheels are available different ways depending on the exact make of of the watch movement. 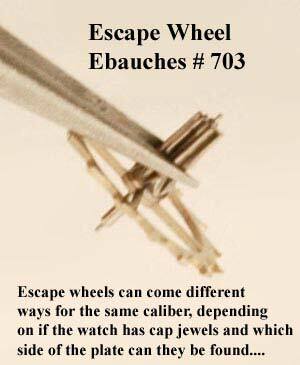 Escape wheels pivots are called "C/C" and are Ebauches #702 is given when the the watch movement has cap jewels (also called endstones)on both the upper (balance side) as well as on the lower (dial) side. The same winding pinion is used by all the Standard (ST) and Font FHF listed here. Calibers, 96, 96-4, 97, 969, 969-4, 974. The Standard 96 or Font 96 (FHF96) hour wheel can be used on the ST 97, however the hand hole size of the ST96 is 1.30 mm, while those used on the ST97 are 1.50 mm. Click the "Order" button to go to the shopping cart. Please provide the specifics of your order in the "Ordering Instructions" box at the bottom of the page. We will process your order from here.